The owner wanted to still enjoy the sound of running water and have a fire pit for campfires. Trail Creek helped her make this happen. After deciding to downsize from her ranch in Jackson Wyoming, the homeowner moved into a townhome on a small lot in Jackson Wyoming. Even though the lot was small, the owner wanted to still enjoy the sound of running water and have a fire pit for campfires. Trail Creek helped her make this happen. 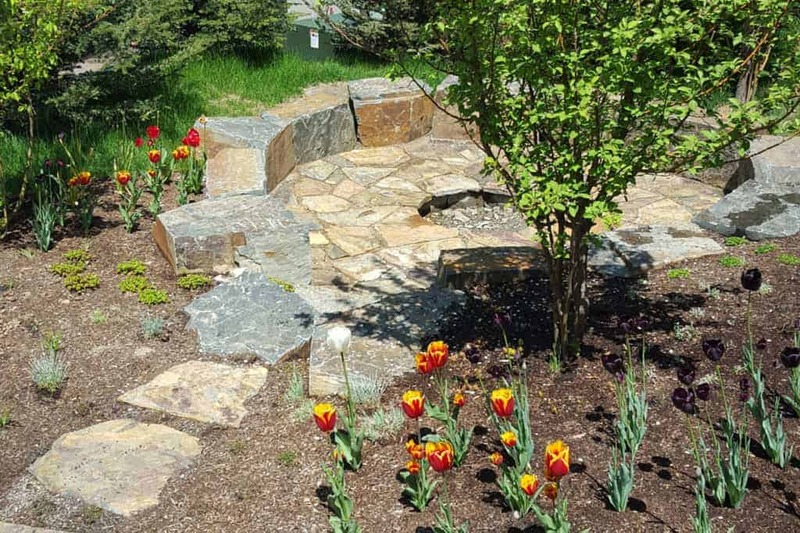 To create the sound of running water, Trail Creek Nursery built disappearing water feature. Drilling through a large boulder, then forcing water through it, the water feature was a success. All the splashing water helped mute the sounds of the town. A fire pit was also built. We planted multiple trees on the property line to create both privacy and a sound barrier.